Indexed in: Scopus, EMBASE, EBSCO. Infectious diseases are slowly becoming a major threat to human survival. Many people predict the return of the pre-antibiotic period due to the emergence of resistance against all major classes of antibiotics. It is now more difficult to treat infectious diseases than it was in the last several decades. Super-bugs, XRDs and TRDs, now result in more deaths than ever before. Many nosocomial infections are now spread in communities, largely affecting the malnourished populations, living in poor hygienic conditions in densely populated regions of the world. Difficulty in treating infections is directly affecting the outcome of surgical intervention, pre-mature birth, and hospital care of elderly and immune compromised patients. The dwindling supply of effective medicines against prevailing infectious diseases is yet another challenge, as fewer and fewer pharmaceutical companies are interested to work in this field due to economic reasons. Yet fortunately academic and research communities continue to work towards understanding the infectious diseases and resistance in positive agents at the molecular level. The scientific literature is constantly being enriched with useful information and seminal discoveries. This is where we feel the eBook series such as the “Frontier in Anti-Infective Drug Discovery” can play an important role in updating the scientific community and providing them with an overview of key recent findings. 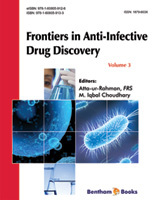 Volume 3 of the eBook series entitled, “Frontiers in Anti-Infective Drug Discovery”, is a useful compilation of six scholarly reviews, contributed by some of the most eminent researchers in the field. We expect this volume to be a useful treatise for researchers interested in infections and their treatments. In the first article, Marino et al skillfully review the success and failures in the discovery and development of anti-tuberculosis (TB) drugs. TB has been a major global threat, particularly in developing countries which has attracted major attention in the last two decades due to emergence of XRD TB, co-infection with HIV, and alarming increase in TB patients. The review focuses on major impediments in anti-TB drug discovery as well as some of the most promising leads currently in the process of development. Bhardwaj et al have contributed a review on the growing understanding of the resistance mechanisms in infection causing microorganisms. The possibility of attacking the virulence of bacteria rather than the bug itself in order to circumvent the MDR has been discussed. The key factors responsible for fast emerging resistance are discussed, along with appropriate scientific and public response. Vaccines have played an important role in controlling viral infections in the past five decades. However, the potential of virus expression vectors for generating vaccines against bacterial and fungal infections has not been fully explored. Hefferon reviews the potential of using the vectors based on viruses for the delivery of vaccines or other immunization agents against infectious diseases. The review also summarizes the current successes and future challenges in using virus vaccines against prevailing infections. Zhang et al have contributed a comprehensive review on the use of Newcastle disease virus (NDV)-based vector vaccines against emerging and re-emerging pathogens. Newcastle disease is one of the most important diseases in the poultry industry. The oncolytic properties of certain strains of NDV have also been discussed as innovative therapy against cancers. The vector-born protozoal tropical diseases cause major mortality and morbidity to a large segment of the world population in over 80 countries. Allahverdiyev et al review various aspects of leishmaniasis, a major disease caused by parasites of the genus Leishmania. Various approaches to combat this wide spread disease, including prospects of development of vaccines, chemotherapy, physical treatment, immunotherapy, phototherapy and nanotechnological products have been discussed. Proantocynidins, polyphonolic natural products of plant origin, are known for diverse biological activities. Yamamoto et al have contributed an article, comprehensively reviewing the in silico and in vitro studies conducted on anti-viral activity of proanthcynidins, particularly dengue virus. This volume of this eBook series is the result of hard work of so many eminent contributors, for which we express our profound gratitude. We would also like to acknowledge the commitment and hard work of the excellent team of Bentham Science Publishers, led by Mr. Mahmood Alam, Director Bentham Science Publishers. The efforts of Ms. Fariya Zulfiqar, Assistant Manager Publications, deserve special appreciation.